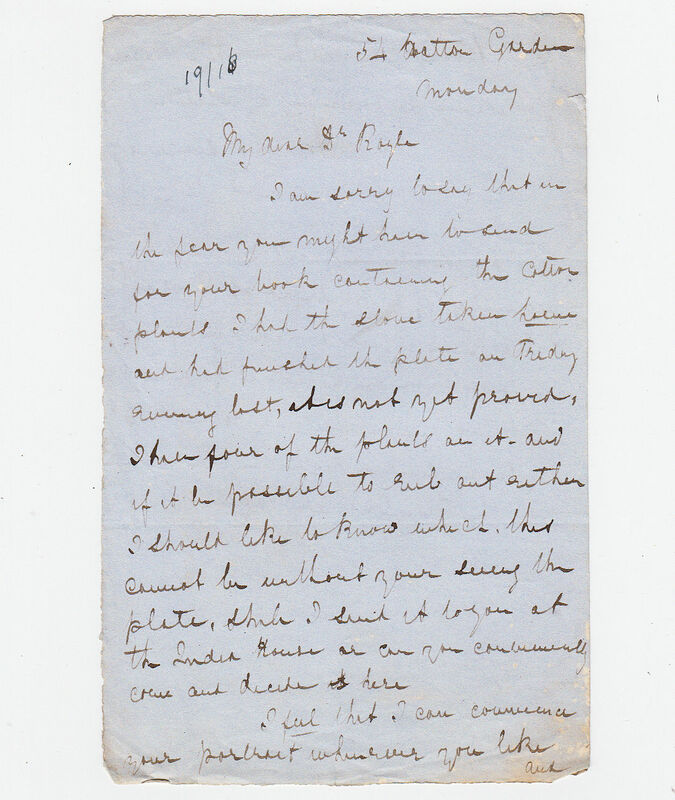 Autograph Letter Signed ‘G.H.Ford’, to Dr. Royle [Dr. J.Forbes Royle, the naturalist,], about the preparation of lithographs of the cotton plants in Royle’s book, requiring Royle to see the plate before Ford makes the necessary alterations, referring also to Ford’s “most successful beginning of the portrait of General Pollock [completed 1850]”. 2 pp. 8 x 5 inches, minor blemishes only, in good condition. 54 Hatton Garden, undated [c.1850]. Uncommon. George Henry Ford (1808-1876), South African natural history illustrator of exceptional merit who joined the British Museum in 1837. At first he portrayed animals and produced the plates in Sir Andrew Smith’s Illustrations of the Zoology of South Africa (1838-1847). Ford drew Smith’s zoological specimens. He proved to be so proficient that in 1825 Smith recommended him to the newly founded South African Museum in Cape Town, and later seconded him to the 1834-36 “Expedition for Exploring Central Africa”. A report on this expedition was “Illustrations of the zoology of South Africa, consisting chiefly of figures and descriptions of the objects of natural history collected during an expedition into the interior of South Africa, in the years 1834, 1835, and 1836, fitted out by The Cape of Good Hope Association for Exploring Central Africa, together with a summary of African zoology, and an inquiry into the geographical ranges of species in that quarter of the globe”. Ford accompanied Smith to England in 1837. G. H. Ford is commemorated in the scientific name of a species of Hispaniolan snake, Epicrates fordii (Ford’s boa).